Higher categorical structures and homotopy methods have made significant influence in geometry and mathematical physics in recent years. This summer school is aimed at transferring these ideas and fundamental technical tools into the next generation of mathematicians. 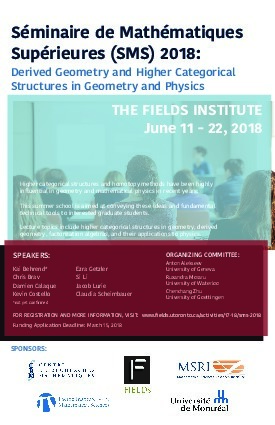 The summer school will focus on the following four topics: higher categorical structures in geometry, derived geometry, factorization algebras, and their application in physics. There will be eight to ten mini-courses on these topics, including mini-courses led by Chirs Brav, Kevin Costello, Jacob Lurie, and Ezra Getzler. The prerequisites will be kept at a minimum, however, a first course in differential geometry, algebraic topology and abstract algebra would be recommended. This annual school, taking place for its 56th edition this year at the Fields Institute,has as institutional partners the CRM, the MSRI, PIMS the ISM, the CMS and the University of Montreal. The funding deadline has passed. If you are a student or postdoc interested in attending SMS 2018, and if you require funding to attend, you must fill out the funding application at the top right corner of this page. The deadline to apply is March 15, 2018. Note that funding for travel will not be covered by the Fields Institute. You may also, in addition to filling out the Fields funding form, apply for sponsorship by the MSRI through this link. Registration is a separate process then applying for funding. In order to confirm participation in the event, the registration form at the top right corner of this page must be completed. A number of single rooms are currently on hold for SMS participants at New College Residence in Wilson Hall Residence – a great dormitory residence at the University of Toronto on the St. George campus in downtown Toronto, which is located at 40 Willcocks Street. Special Rate: $38/night for single rooms. Included are linens and a pillow, a small towel, and wired and wifi access (bring your own ethernet cord for wired internet access). Common rooms and washrooms are down the hall from the rooms. Taxes are currently 13%. Reservations can be made by going to www.torontores.com and filling out a Reservation Form. Click on "Book A Room". Fill out the 2018 Summer Residence Reservation Form for Short Term Stays (between 1 to 28 nights) and e-mail or fax it to them. Be sure to enter Special Rate Code “SMS2018” on your Reservation Form. Book as soon as possible to guarantee availability. CUT-OFF DATE: Wednesday, April 20, 2018, 5:00 pm EST. The cut-off date for accepting reservations into this room block is April 11, 2018. After the cut-off date, all rooms not reserved by individuals will be released to general inventory for sale and New College Residence may accept reservations on a space available and rate available basis only. The Fields Institute housing resources webpage also provides information on other short- and long-term accommodation options. Quantum groups, quantum field theory and Koszul duality, I: Chern-Simons field theories in various dimensions. Quantum groups, quantum field theory and Koszul duality, II: Quantum groups from Chern-Simons field theories. Quantum groups, quantum field theory, and Koszul duality, IV: Koszul duality patterns in holography.